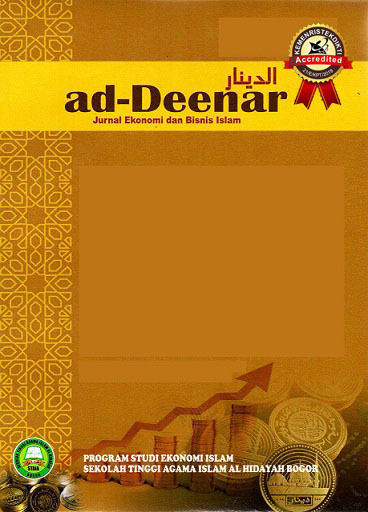 Ad-Deenar: Jurnal Ekonomi dan Bisnis Islam: is a peer review of national journals published by the Shariah Department of the Sekolah Tinggi Agama Islam Al Hidayah Bogor, Indonesia in the Syariah Banking study program. This journal focuses on issues of Islamic Economy and Islamic Business. We invite scientists, researchers and professionals in the field of Syariah Banking to publish their research in our Journal. Ad-Deenar: Jurnal Ekonomi dan Bisnis Islam has become a Crossref Member since year 2018. Therefore, all articles published by Ad-Deenar: Jurnal Ekonomi dan Bisnis Islam will have unique DOI (Digital Object Identifier) number. In 2019, Ad-Deenar: Jurnal Ekonomi dan Bisnis Islam has been accredited by Decree of the General Director of Strengthening Research and Development, Ministry of Research, Technology and Higher Education of the Republic of Indonesia Number 10/E/KPT/2019. PERJALANAN BISNIS NABI MUHAMMAD S.A.W.